Home › General Wellness › What are the Best Natural Solutions ﻿for Pre-Menopause Symptoms? Did you know that hot flashes can last more than eleven years in some women, or that women approaching menopause can be kept up at night because their brains are excreting “fight-or-flight” chemicals? Are you aware that certain foods and beverages, like caffeine-containing coffee, can aggravate menopausal symptoms like headaches and migraines? Despite the North American Menopause Society‘s estimation that nearly 50 million women in America have gone through menopause (with millions more approaching it), most people have a fairly limited understanding of this inevitable part of aging that begins, for most women, between the ages of 45 and 55. I’d like to explain the biology behind menopause, dispel some myths about it, and share some natural solutions that can help ease the transition. Whether you are approaching menopause, are in the middle of it, or simply have a loved one dealing with these issues, a little knowledge and understanding makes it easier for everyone. As most of us know, a woman begins the reproductive stage of her life when she has her first period (known as menarche). This typically occurs between the ages of 11 and 15. The menstrual cycle is the term for the regular, natural changes that happen in the uterus and ovaries to make pregnancy possible. This process starts when the brain releases hormones (called gonadotropins) that trigger a cascade of events resulting in the ovaries releasing a single egg each month. Ten days prior to the release of the egg, estrogen levels build to help grow a new lining in the uterus (called the endometrium) to prepare for the fertilized egg. As the egg travels down the fallopian tube, a hormone called progesterone is released to thicken the uterine lining and prepare the body for pregnancy. If there is no fertilized egg, the uterus sheds its lining (menstrual bleeding), and hormone levels return to normal until the next menstrual cycle (usually every 28 days). As a woman leaves reproductive age, the body stops making as much estrogen and progesterone as it used to. This triggers the various natural responses that we associate with menopause, such as hot flashes, mood swings, weight gain, and low libido. Although we tend to use the term “menopause” to describe the changes a woman’s body goes through before she’s through her life’s reproductive period, this phase is actually called perimenopause. According to the Mayo Clinic, perimenopause refers to the period of time in which a woman’s body makes the natural transition toward permanent infertility and typically begins several years before menopause, when the ovaries are gradually making less estrogen. In the last 1 to 2 years of perimenopause, the drop in estrogen quickens. At this stage, many women experience symptoms like hot flashes and sleep problems. Symptoms like fatigue, depression, breast pain, and headaches are also common at this stage, but talk to your doctor if your symptoms are so severe that they significantly affect your quality of life or wellbeing. Menopause is defined as the point when it has been a year since a woman’s last menstrual period. Due to this definition, the official start of menopause is always determined retroactively. We know what happens biologically when menopause occurs (estrogen and progesterone levels fall, etc. ), but what has eluded researchers to this point is why it happens. While the Mayo Clinic has found that the average age of menopause is around 50, a study published in American Journal of Epidemiology found that one’s exact age at menopause can vary based on race, lifestyle, and the regularity of one’s menstrual cycle when approaching menopause. While a “surgical” menopause (the result of a hysterectomy that throws one immediately into menopause) can occur at any age, even natural menopause can occur for women as early as their mid-30s or as late their early-60s. While this is the best-known symptom of menopause, it is simply not true that this is always the first sign. Hot flashes will inevitably come with menopause (though their intensity can vary from woman to woman), but fatigue, anxiety, weight gain, hair loss, fuzzy thinking, low libido, breast pain, night sweats, and irregular periods can just as easily be your sign that menopause is near. The best thing to do is to be in tune with your body and look for any noticeable changes. If something seems significantly different, talk to you doctor to see if these symptoms are related to menopause and if there are any lifestyle changes you need to make as a result. Anyone who has dealt with menopause surely wishes this were true! While physical symptoms like hot flashes and fatigue are prominent, there are just as many mental and emotional menopause symptoms as there are physical ones. A study from Obstetrics & Gynecology Clinics of North America found that menopause and perimenopause are periods of heightened risk for depressive symptoms and disorders. Many women also notice changes in their memory and concentration due to sudden shifts in hormones. Decreases in estrogen and progesterone levels are responsible for mood swings and irritability. Hormone replacement therapy (HRT) is a regimen of taking medications that contain female hormones to replace the ones the body does not produce anymore after menopause. While HRT has been an effective way for some women to maintain hormone levels, and used to be the standard treatment for reducing premenopausal symptoms, we now know it comes with some major health risks. The American Cancer Society says that HRT increases the risk of certain cancers (such as breast and uterine) and should only be done after discussing the possible risks and benefits with your doctor. Fortunately, women can turn to natural remedies and herbal supplements for a lower-risk solution to menopausal and premenopausal symptoms. A great place to start is by increasing your consumption of soy foods. A comprehensive study, published in the journal Menopause, found that 2 daily servings of soy can reduce the frequency and severity of hot flashes by up to 26 percent. The isoflavones in soy foods help balance hormone levels and have some estrogenic activity. You want to get close to 50 mg of these soy isoflavones daily, which can be done by drinking two glasses (16 oz) of soymilk and eating 7 ounces of tofu each day, or by simply taking a supplement like Isoflavone-250 w/Genistein by Douglas Laboratories. Flaxseed is also useful for combating menopause symptoms. The power of flaxseed lies within its lignans (chemicals compounds found in plants like flax), which are important modulators of hormone metabolism. The University of Maryland Medical Center states that flaxseed’s lignans are a safe and effective way to improve reduce hot flashes and vaginal dryness (especially when paired with soy). You can grind flaxseed in a coffee grinder at home and use 1 to 2 tablespoons a day, or try Flax Lignan SDG by Vital Nutrients for an easy way to harness flaxseed’s benefits. Making sure your vitamin E levels are sufficient can also help, especially with hot flashes. A study from Gynecologic and Obstetric Investigation recommended vitamin E for hot flashes because vitamin E may act as a substitute for estrogen. Since the main cause of hot flashes is reduced estrogen levels, it makes sense how vitamin E would help. The recommended dosage of vitamin E for menopausal women is 600 to 800 IUs, so just a couple softgels of Natural Vitamin E By Vital Nutrients will do the trick. Evening primrose oil (EPO) can also be an effective tool in managing menopause symptoms, especially breast pain or tenderness, according to Clinical Perspectives in Complementary Medicine. EPO contains gamma-linolenic acid (GLA), which serves as a building block for prostaglandins (a substance that increases hormone production) and helps moderate menopausal symptoms. I like EPO by Pure Encapsulations as a reliable way to keep prostaglandin and hormone levels high enough to keep hot flashes and other symptoms at bay. The key here is that every woman has different symptoms at different times, and some experimentation in regards to what is right for you may be the best solution. It may be the case that just one of these can help, or it may take a combination of some of these supplements. Your doctor can help you with what to try first. Another effective, natural approach to dealing with menopausal symptoms is a product by Metagenics called Estrovera. Estrovera uses the special extract ERr 731, from the roots of rhapontic rhubarb, and the clinical results of trials on Estrovera’s effectiveness (conducted both by Metagenics and outside researchers) are quite exciting and definitive. 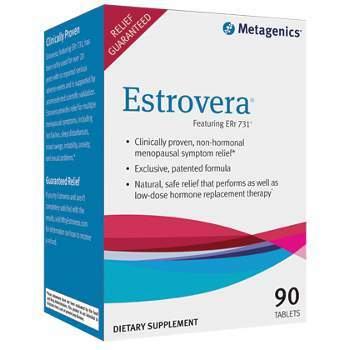 Metagenics conducted a 12-week study on Estrovera’s impact on perimenopausal women and found significant improvements in symptoms, including hot flashes and anxiety, within just 28 days. Another 12-week study, performed by Metagenics’ Functional Medicine Research Center, found that Estrovera reduced the median number of daily hot flashes from 12 to 2. A more extensive 6-month Metagenics study found that Estrovera demonstrated significant relief from a wide range of menopausal symptoms like irritability, joint and muscle discomfort, fatigue, and insomnia. Menopause can be a difficult journey no matter what, but it’s much more manageable if you can use remedies from nature to help ease the transition. While there is no product or solution out there that will save you from all of the unpleasantness of menopause, these recommendations should help keep your spirits up and prevent menopausal symptoms from having a strong, adverse effect on your quality of life. I’d like to explain the biology behind menopause, dispel some myths about it, and share some natural solutions that can help ease the transition. Although we tend to use the term “menopause” to describe the changes a woman’s body goes through before she’s through her life’s reproductive period, this phase is actually called perimenopause. Perimenopause refers to the period of time in which a woman’s body makes the natural transition toward permanent infertility and typically begins several years before menopause; in the last 1 to 2 years of perimenopause, the drop in estrogen quickens. At this stage, many women experience symptoms like hot flashes and sleep problems. Symptoms like fatigue, depression, breast pain, and headaches are also common at this stage. While the the average age of menopause is around 50, a study found that one’s exact age at menopause can vary based on race, lifestyle, and the regularity of one’s menstrual cycle when approaching menopause and can occur for women as early as their mid-30s or as late their early-60s. While this is the best-known symptom, it is not always the first sign. Hot flashes will inevitably come with menopause, but fatigue, anxiety, weight gain, hair loss, fuzzy thinking, low libido, breast pain, night sweats, and irregular periods can just as easily be your sign that menopause is near. Menopause and perimenopause can also be a period of heightened risk for depressive symptoms and disorders. Many women also notice changes in their memory and concentration due to sudden shifts in hormones, these shifts are also responsible for mood swings and irritability. Hormone replacement therapy (HRT) is a regimen of taking medications that contain female hormones to replace the ones the body does not produce anymore after menopause and used to be the standard treatment for reducing premenopausal symptoms, we now know it comes with some major health risks. A comprehensive study found that 2 daily servings of soy can reduce the frequency and severity of hot flashes by up to 26 percent. The isoflavones in soy foods help balance hormone levels and have some estrogenic activity. You want to get close to 50 mg of these soy isoflavones daily, which can be done by drinking two glasses (16 oz) of soymilk and eating 7 ounces of tofu each day, or by simply taking a supplement like Isoflavone-250 w/Genistein by Douglas Laboratories. Flaxseed is also useful for combating menopause symptoms, it’s power lies within its lignans (chemicals compounds found in plants like flax), which are important modulators of hormone metabolism. Making sure your Vitamin E levels are sufficient can also help, especially with hot flashes. A study recommended vitamin E for hot flashes because vitamin E may act as a substitute for estrogen. The key here is that every woman has different symptoms at different times, and some experimentation in regards to what is right for you may be the best solution. It may be the case that just one of these can help, or it may take a combination of these supplements, your doctor can help with what to try first. Another effective, natural approach to dealing with menopausal symptoms is a product by Metagenics called Estrovera. Estrovera uses the special extract ERr 731, from the roots of rhapontic rhubarb, to make a safe, natural menopausal hot flash relief supplement that is about as effective as low-dose hormone therapy.